Bryan Songy and Matthew K. Sears in As He Likes It: A Shakesqueer Comedy. Photo by Ryan Krukowski Media. 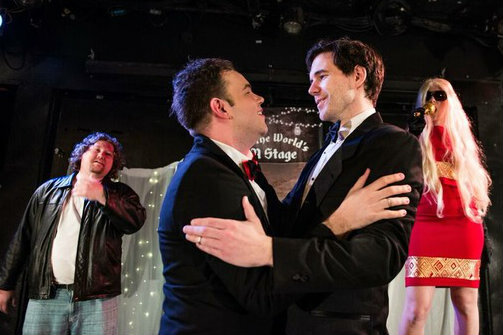 BOTTOM LINE: As He Likes It is a fun LGBTQ twist on the Shakespearean classic. Rosalind is Ross in this new adaptation of As You Like It. Ross (Bryan Songy) falls for the handsome Orlando (Matthew K. Sears) at first sight, but as in the original, they are torn apart due to complicated circumstances. And of course, hijinks ensue. Both Orlando and Ross are on the run, but they need to find each other again. Will they do so in the forest? The adaptation by Genny Yosco (who also plays Phoebe) not only twists the gender of Rosalind, but Silvius become Silvia (Wendy Watt). A cursory knowledge of As You Like It is helpful to understand this version, since there are a lot of main characters (not to mention secondary and tertiary ones) and it’s often hard to keep track of who is who, especially when genders are being switched around and characters share the same names. Orlando flees to the Forest of Arden for his own safety, bringing his trusty servant Adam (a brilliantly funny and versatile Katherine Yacko) along for company. For Arden, the team makes wise use of the Kraine's rotating panels, adding dimension to the simple space. Ross and Celia (Amanda Nicastro) follow Adam and Orlando into the forest. Ross and Celia dress in disguises—Ross in a dress—and Shakespeare's cottage and sheep here become a lucrative pot farm. The original play ends in a wedding, or four weddings, that is. The four weddings appear here too, but with a special, unexpected musical guest. As He Likes It is an enjoyable Shakespeare-inspired romp, in the form of a very condensed As You Like It. The whole cast holds their own, even if the plot is somewhat hard to follow. The costumes and set are clever and well designed, and it’s ultimately a fun night at the Frigid Festival, particularly for Shakespeare nerds. As He Likes It: A Shakesqueer Comedy is by Genny Yosco, based on William Shakespeare's As You Like It. Directed by Genny Yosco. The cast is Jack Butler, Will Dietzler, Ken Dillon, Anthony Host, Amanda Nicastro, Matthew Preston, Matthew K. Sears, Bryan Songy, Wendy Watt, Chris Weigandt, Katherine Yacko, and Genny Yosco.